It’s the start of a new arc and the start of a new framing story, although unlike the previous issues, it seems like the framing narrative will be the central story. 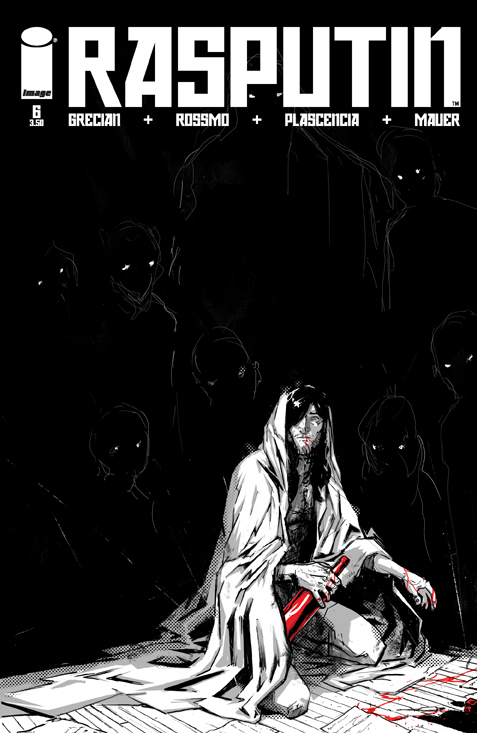 Alex Grecian and Riley Rossmo have decided to take their story away from the mythical/historical feel of the first arc and into modern day fantasy. This is a bold step, removing their story from the Rasputin myth, and creating something new with the character. 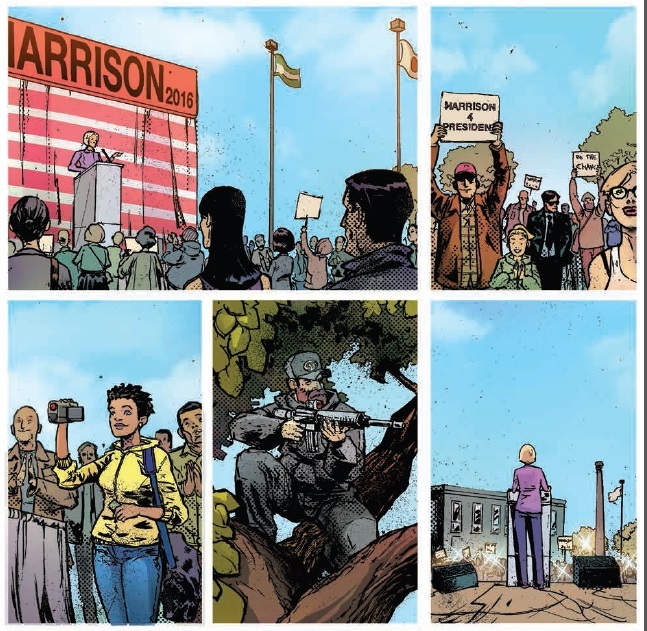 The story starts on the election campaign for the President of the USA where Rasputin appears to be working for Ms Harrison, one of the candidates. At a rather under secured rally in Dallas, a sniper takes a shot at the presidential candidate and all hell breaks out. 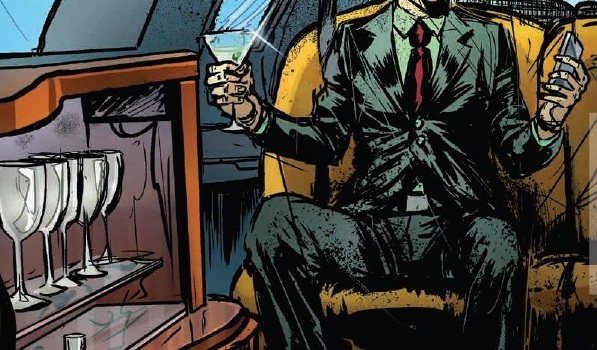 Rasputin, chilling out with a glass of champagne in the back of a limo, gets a feeling somethings wrong and rushes to the chaotic scene. Making sure that he’s taken care of the witnesses, he assesses the situation and decides he only has one option: the healing hands. He then turns his hand to conspiratorial cover up; but has he been as clever as he thinks? Shunted into the centre of this modern day story is a tale of Rasputin’s darkest hour and the secret consequences of his healing power. As he lays seriously injured (possibly dead) on a battle field, the visions of his ghosts appear to him and he heals himself. But after the event not all of the ghosts have gone, in fact one has manifested itself as flesh as lays dead in the mud. An innocent soul for the life of the mad monk. After the beauty and mystical air of the first arc this opening to the second is a bit jarring. It thrusts the readers into political intrigue and a very modern setting without any warning and then stays there for the majority of the issue. If, like me, you were expecting a similar format to the previous issues then you may be disappointed. I know there were some criticisms about the unrealistic nature of the story Grecian and co were telling but there was a clever balance between myth and fact. All of that has been abandoned now however and because of this, it loses some of its appeal. It was interesting to see myth and fact woven together but by moving the story outside that setting it has lost one of the most endearing aspects of the story. The artwork still has some of the enchanting feel from before but the modern setting diminishes this and it becomes starker, less beautiful to behold, which is a huge shame. When the story was lacking in previous issues, the pure brilliance of the imagery was able to carry the comic but that is not so in this issue. Here, there is no distraction and some of the dialogue falls a bit flat and clichéd. This is an action packed issue which has a number of surprizing reveals; Grecian is obviously not hanging around when it comes to moving the story forward. 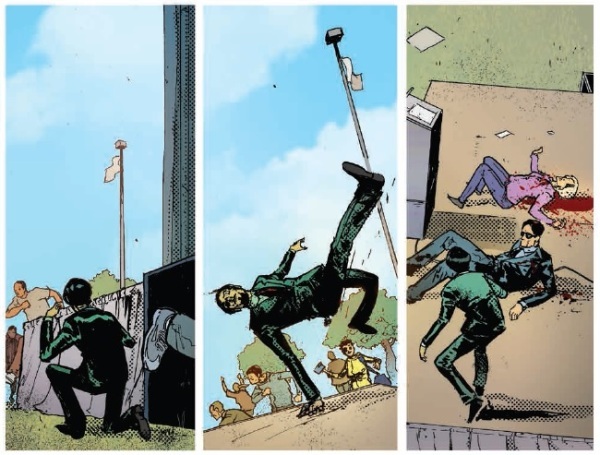 Unfortunately this comes at a cost to the art, similar to the cost to Rasputin when he heals himself; a small amount of the soul is lost to give the characters a modern day life.